Do you ever dream about work? I do. This blog post came to me in a dream. That’s how you know I’m in deep. Either that or I need to get a life. Regardless, I woke up this morning with these things embossed on my brain. 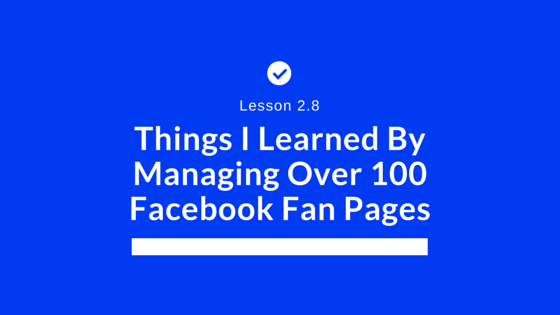 These tips for managing Facebook fan pages are too good to keep inside, so here you are. Hope you put it to good use. Yes, it is absolutely good to know when your fans are online. It’s also good to know when they are consuming your content, but through trial and error I have found that spontaneous posts, those that aren’t planned are often the most engaging, liked, commented on and viewed. Am I telling you to stop scheduling all together? Absolutely not. But throw in a curve ball here and there. It can do wonders. Here’s a pro-tip. If you see something viral or spreading fast and you can spin it to make sense for your audience, share that on your fan page. The more relevant pages you follow, the more you’ll be exposed to what other people are sharing and reacting to. Plus, it’s a great way to reshare content from pages that fit your audience’s likes. Not only does this allow you to act spontaneously, but it also allows you to trend forecast and build relationships with other fan page owners. It’s always a good idea to tap into the power of reciprocation. You’ll notice a few people who like all your posts. Maybe they comment too. These are your Facebook super fans. Get to know them. Reach out. Reward them. Showing a little love can go a long way. Social media evolves and you have to evolve right there with it. Don’t fall into a rut where you only post videos, or photos, or links. Mix it up and measure. Another thing you want to be aware of is timing. Don’t always post at the same time, even if you are scheduling. Think something will go over well. Post it. Don’t be afraid to try new things. You may find a hidden gold mine. User generated content is golden. It’s a testimonial in photo form. What can be better. Plus, it gives you a ton of content to work with. Create a contest to encourage more users to submit their photos and videos to you. Of course give your fans a shout out so they know it is appreciated. User generated content is the gift that keeps on giving. Plus millennials love it. Ever notice on your home page that you see content from different fan pages at different times? That’s because you are interacting differently with Facebook month over month. One month you may be really into something, the next not so much. Your fans are no different. Take advantage of the fans who are into you this month and work it to your advantage. Facebook insights are great, but what’s even better is tracking what really matters and that’s traffic, leads and sales. We use Infusionsoft so it is really easy for us to track where your leads are coming from. You can also use Google Analytics or other analytic software to track where your Facebook users are going on your site. With this knowledge you can also do some pretty slick things with advertising. Too many people focus on follower counts. Yes, you need fans, but the more niche and focused your followers are, the better results you are going to get anyway. Start looking at engagement and more importantly traffic, leads and sales. Those three things are really the most important. I like to make sure I get notifications when our client’s competitors are posting. This way I never miss one and I can see what they are up to and mimic things that work well. Their audiences are clearly the same so why not give the fans what they want. Sometimes you just need a little push in the right direction. This may sound strange, but when I schedule and post directly to Facebook, I see more reach than using a tool like Buffer or Hootsuite. Not only that, but when you post directly you have the ability to add emotions and tag people making your post much more authentic. Try it, let me know if you see the same thing happening. I know, I know. Budgets are tight. But with a strategic advertising plan you can reach more people and convert more people. Get super focused and super targeted. Use email addresses, use social data and test, test, test.